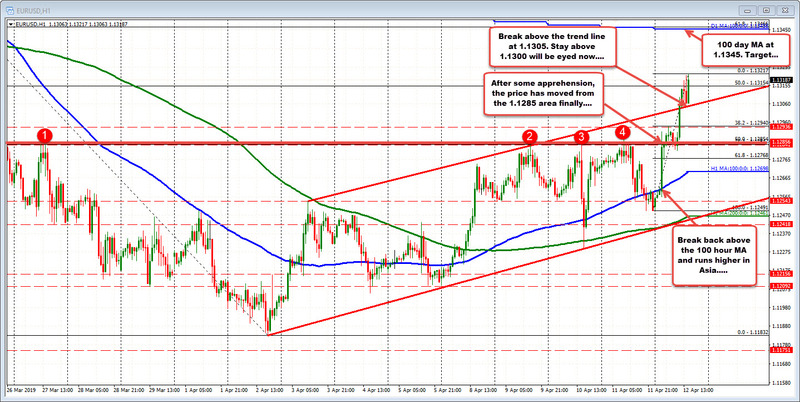 The EURUSD is soaring in higher in trading today helped by risk on flows and technical breaks. Technicaly, the price was able to get above - and move away from the 1.1285 area that has been a ceiling of late for the pair. After that, the pair cracked above a topside trend line at 1.1305 currently and has been able to stay above that line too. We trade at session highs and the highest levels since March 26. The pair is also trading above and below the 50% midpoint of the move down from the March 20 high at 1.13154 (high not shown). Watch the 1.1300 -05 area for close support. Below that the 1.1285 area is the 50% of the 72 pip range today and that ceiling (see red numbered circles) that confined the trading this week (until today's break away). The price cannot go below that level for the bulls. The squeeze is on today. 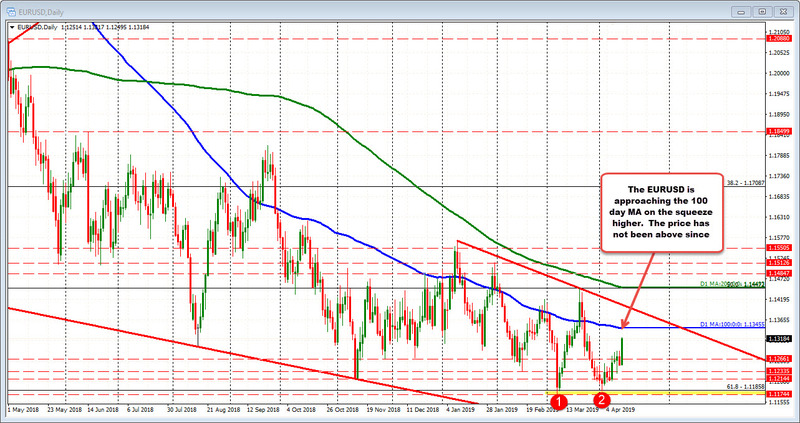 ON the topside, the pair is getting closer to the 100 day MA at the 1.1345. The price has not been above the 100 day MA since March 22 (see chart below). PSS the shorts in the EURUSD as per the commitment of traders was the highest since Dec 2016 (CLICK HERE). Could lead to a squeeze.